As a Marxist, Frank has no hesitation in rooting dependency in the twin ‘evils’ of colonialism and Capitalism. Between 1650 and 1900 European powers, with Britain in the lead, used their superior naval and military technology to conquer and colonise many parts of the world. Paul Harrison (1990) argues that the principal result of the European empires was the creation of a global economy on European terms and the beginnings of the world capitalist system…. Colonies were primarily exploited for their cheap food, raw materials and labour – eg; Britain’s virtual monopoly over cotton benefited expansion of the Lancashire and Yorkshire textile industries. It’s worth noting that cheap labour also included slavery. From 1650 to 1850 some 9 million Africans (between the ages of 15 and 35) were shipped across the Atlantic to work as slaves on cotton, sugar and tobacco plantations in America and the West Indies, owned mainly by British settlers. The British slave-traders and the plantation owners made huge profits. The most fertile land was appropriated for growing ‘cash crops’ for export to the West. New markets in the colonies were created for manufactured goods from the industrial world. Local industries, especially manufacturing, that attempted to compete with those of the colonial powers, were either destroyed or undermined by cheap imported manufactured goods from the West. Division and conflicts were created or reinforced between indigenous peoples as the colonial powers sponsored favoured tribes. Arbitrary borders were imposed, especially in Africa – these represented the boundaries of the lands conquered by each colonial power but they often cut across tribal boundaries, placing one part of a tribe in one European colony with part of another tribe with whom they may have had long running conflicts while another part of the first tribe would find themselves in a neighbouring but totally different European colony. In Integrated SocioPsychology terms, this disrespect of African PURPLE tribalism by European RED/BLUE can be attributed as a major cause of conflict in the post-colonial era. Liberals like John Goldthorpe (1975) have been keen to point out that colonialism has had positive benefits such as providing developing countries with a basic infrastructure. Colonialism provided people with wage-labour and made more efficient use of land. Goldthorpe’s arguments certainly have their merits but the point about infrastructure, at least, should not be applied universally. Pre-colonial Africans should not be seen homogeneously as primitive tribes living in mud huts until the Europeans took over. Some records of the time, such as those of Olfert Dapper (1686), show African cities not far behind those of Europe in terms of development and sophistication. 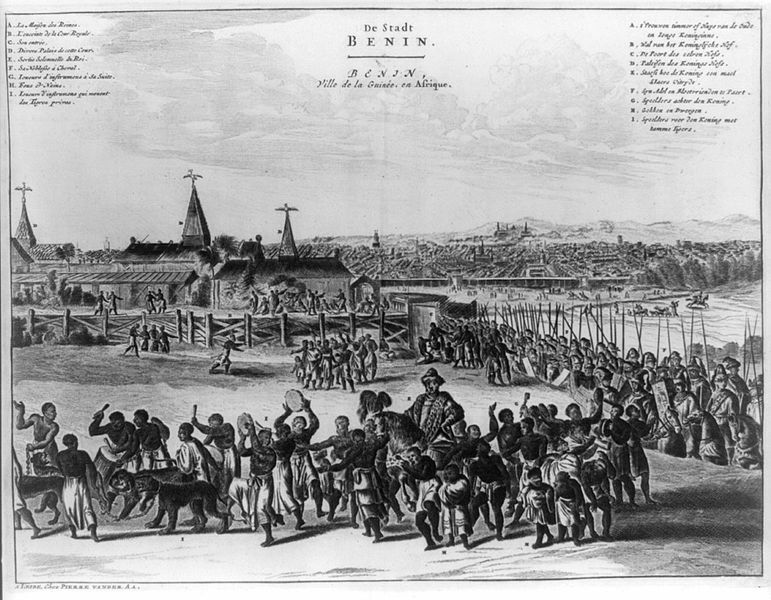 Dapper’s illustration of Benin in Nigeria below shows 2-storey buildings, a helmeted and horse-mounted guard and, in the distance, a walled city with streets in grid formation. Goldthorpe also points out that, following World War II, countries without colonies – eg: Germany and Japan – have prospered more than those with empires. Moreover, he points out countries which were never colonised fully, such as Ethiopia and Afghanistan, face severe problems in development because they lack the infrastructure provided through colonialism. While the vast majority of the European colonies had achieved independence by the early 1970s, Frank argues that their dependency continues through neo-colonialism and that this can be just as harmful to those countries and their peoples as slavery and colonialism. Their former masters had frequently organised the economies of the colonies to concentrate on one or 2 crops or materials – primary products – required by their own domestic industries. When these countries became independent, they were largely dependent on these products for export earnings. In 2006 Oli Brown & Jason Gibson estimated that, of approximately 2.5 billion people in agriculture in developing countries, about 1 billion received most of their income from exports of agricultural or mineral commodities. Out of 141 developing countries, 95 depended on commodities for at least 50% of their export earnings. Approximately 2/3 of African countries got over 60% of their export earnings from one or 2 commodities – see table of agricultural exports left for key examples. Overproduction of the primary products, or any fall in demand due to a variation in Western tastes and lifestyles, can have a severe negative effect upon their economies. This can be made worse by their markets often consisting of only a few metropolitan countries rather than many. (The main one is often their previous colonial master.) Prices have risen recently for some commodities – eg; copper, aluminium, rubber and soya beans – due to soaring demand from China which now accounts for 15% of global imports of these commodities. However, if China’s economy were to slow down – as it did considerably in the early days of the 2008 global recession – then commodity prices will tumble across the board. Raw materials have little value in themselves. It is the processing of those raw materials into manufactured goods that adds value in terms of the prices charged to the consumer. This processing mainly occurs in Western countries and, consequently, it is the West that reaps the benefit. Broswn & Gibson give the example of a £1 chocolate bar in the in the UK providing the UK-based manufacturer with 77p per bar (before deduction of costs), 17p straight to the government as VAT (at the pre-2010 rate) and only 6p to the cocoa farmers (before deduction of tax and costs). If coffee was processed and packaged in the countries in which it was grown, much of the profit from the ‘value-added processes’ of such processes and packaging would be lost to the company selling the coffee to the supermarkets in the core cities. The ironic by-product of this is that most of the instant coffee drunk in a major coffee grower like Brazil is imported via transnational corporations (TNCs). Sometimes the value of a commodity may be totally out of the control of the producer country – with its price being set by commodity speculators in Western organisations such as the London Metal Exchange. The Merrill Lynch Bank estimated in 2006 that commodities were trading at 50% higher than they would have been without speculation. Any fluctuation in the world’s money or credit market could burst this financial bubble. The money earned by the export of primary commodities can also be severely undermined by natural disasters, political instability and military conflict. Western countries may also restrict the export of technology such as machine tools, computers and processing equipment to developing countries – usually on the grounds that the political flavour of the government of a developing country is unacceptable. Fernando Henrique Cardoso (1972) points out that these elites enabled TNCs to penetrate into developing countries on highly-favourable terms for the Western Capitalists. In doing so, they benefit economically themselves from the related trade and banking arrangements. 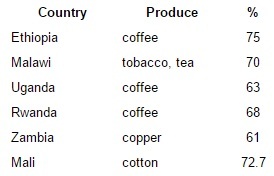 Eg: it has not been just the traders on the world commodity markets who have exploited coffee producers in Brazil but also the Brazilian merchants exporting the coffee and the landowners who enjoyed a good lifestyle at the expense of the landless agricultural workers. The likelihood is that such elites would be happy for Brazil to remain a dependent coffee producer. In some extreme cases, the elites, often military in origin, have even used violence to remove threats to foreign interests in their countries. The police, with repressive powers, are often used to assure the co-operation of the masses. Transnational exploitation of the resources and labour of developing societies is seen by Dependency theorists as a crucial aspect of neo-colonial power. Interestingly, the term ‘banana republic’ often applied disparagingly to Latin American countries right up to the 1990s – to indicate they were backward and corrupt – comes originally from the fact that countries like El Salavador and Nicaragua were under the control of local oligarchies or families who were paid employees of American fruit companies such as United Fruit. A key criticism of Dependency Theory is that it does not adequately address the issue of homegrown elites. Frank glosses over the fact that Western exploitation of developing nations usually has been – and still is – facilitated by the local elites. Such elites played a critical role in the slave trade and colonialism. Today many of them sit on the boards of TNCs and take financial advantage of the huge sums of money being injected into their countries via aid. This looks very much like the TNCs’ ORANGE exploiting the myopic RED vMEME of the local elites who can see little beyond the reinforcement of their power and status which the TNC association gives them, along with the instant gratification of the wealth that comes with it. As RED is focused only on its own immediate needs and wants and, being the manifestation of what Sigmund Freud (1923b) called the Id, has no real conception of consequences, it is ripe for exploitation by the far-thinking and highly-manipulative ORANGE. Small wonder that the Commission for Africa (2005) reported that poor governance and corruption by elite ‘kleptocracies’ were partly responsible for the poor condition of many African countries at the start of the 21st Century. Is Modernisation an inescapable dependency trap? Frank certainly considered Modernisation Theory a trap, arguing that the periphery can never develop in a sustained way so long as they are stuck in what Paul Baran (1957) calls an ‘imperialist’ stage of Capitalism and remain part of the world capitalist system. Franks’ theory suggests one way of escape is for a country to isolate itself as China did. However, the emergence of China as a major economic power on the world stage in the noughties was driven by the adoption of Capitalist free-market principles and extensive trading with the West – a buy-in to certain values of Capitalism. When Egypt, under the radical president Gamel Abdel Nasser, tried to break away by nationalising the Suez Canal in 1956, the country was invaded by the combined forces of Britain, France and Israel. Cuba broke away via its Socialist revolution in 1959, with leader Fidel Castro pledging that Cuba would no longer be ‘a puppet of US imperialism’ and controlled by multinationals. Following the revolution, the United States first sponsored and militarily supported the disastrous Bay of Pigs landings by counter-revolutionaries (April 1961). Following that failure the US imposed an economic blockade that prevented Cuba exploiting its own natural resources and economic potential. The Soviet Union provided economic support and some degree of military protection until the collapse of Soviet Communism at the end of the 1980s. Living standards, already low, deteriorated disastrously, leading to a virtual exodus of economic migrants putting out to sea in small boats and makeshift rafts, heading for Miami. By 1994 the US Coast Guard estimated that some 1,200 Cubans per day were setting out for the American shoreline but only about 800 per day either made it or were picked up by the coast guard. In spite of the high human cost of the blockade, the Americans kept it in place. Still Cuba has prospered in some respects, being among the top 5% of 125 developing countries in terms of adult literacy rates, infant and maternal mortality rates and life expectancy. Perhaps surprisingly the Castro regime still enjoyed a significant degree of support amongst the Cuban people through all these travails. However, it has been the mildly-reformist regime of Fidel’s successor, brother Raúl Castro, introducing an amount of economic liberalism which has created the conditions for a partial thaw in relations with the US. See the Blog post Cuba on the Cusp..? for a more detailed analysis of Cuba-US relations. In spite of the North Vietnam-based Communists winning wars against first the French and then the South Vietnamese and their American allies, the independent and reunified Vietnam has been subject to a similar economic blockade to Cuba. The Americans agreed to lift the blockade when Vietnam’s Communist government at least partly accepted the Americans’ demands to implement policies of economic liberalisation and to move towards the development of Capitalist markets and political democratisation. A second way of dealing with dependency that Roberts & Hite discuss argues that there is some scope for ‘associate development’ or ‘dependent development’ through nationalist economic policies such as ‘Import Substitution Industrialisation’ (ISI). This involves industrialisation to produce consumer goods that would normally be imported from developed countries. Hoogvelt comments on how ISI transformed the economies of South America, with industrial output increasing sixfold between 1950 and 1980 – Mexico supplying 95% of its own consumer goods and Brazil 98% of its own. Dawn Elliot & John Harvey’s (2000) in-depth study of Jamaica illustrates aspects of both viewpoints. The researchers conclude that Jamaica’s development problems will never be solved by policies that ignore the vast inequalities in power arising from Jamaica’s political, social and economic history – principally the creation of the plantation economy by the British which resulted in vast inequalities in ownership of land that persist to this day. In modern times the Jamaican economy continues to serve the needs of the Jamaican ruling class rather than those of the masses. Despite the difficulties in finding a way out of dependency, Hoogvelt notes that Dependency Theory had an impact on the political ideologies of many developing countries in the 1960s and 1970s. In particular she points out that many political leaders, especially in Africa, used the principles of Dependency Theory to argue for a different route for development to Modernisation Theory, portraying development as liberation from Western exploitation. Political and social movements in Africa in this period consequently stressed nationalism, self-reliance and de-linking as a the means to counter neo-colonialism. Not too dissimarly the ‘liberation theology, movements in South and Central America during the 1970s and 1980s saw freedom from the oppressive and corrupt regimes sponsored and supported (sometimes militarily) by the Americans as development. The latter can be understood as a GREEN-infected religious idealism. Is Dependency Theory an adequate critique of Modernisation Theory? Roberts & Hite criticise Dependency Theory for failing to explain why there appear to be greater levels of exploitation over time and why there appear to be significant differences among poorer countries. However, commentators such as Peter Evans (1979) and Gary Gereffi (1994) argue that the core is not always homogenous either and that differences in the periphery elites can explain different political regimes, economies and class relationships in the peripheral countries. The success of the so-called ‘Asian Tigers’ (Thailand, Indonesia and, in particular, South Korea) in the late 1980s and the 1990s was hailed in some quarters as showing that Frank was wrong and Modernisation Theory did not always result in dependency. In these cases, the investment came from Japanese aid and transnational investment. However, the neo-Marxists pointed out that the Asian Tigers were heavily in debt and much of their industrial base was controlled by Japanese TNCs. They were also keen to point out the economic success of the Asian Tigers depended on people working very long hours for very low wages, with only the top 10% of the population really benefiting. When the Japanese economy ran into serious problems in the 1990s and much of its investment was pulled out, the economies of the Asian Tigers became seriously unstable. In 1997 Thailand, Indonesia and South Korea were all obliged to accept Western rescue packages. It remains to be seen if the new 21st Century investment-dependent ‘tigers’ of India and Brazil will prove as vulnerable. Cases like the Asian Tigers which seem to rise from the periphery, threaten to enter the core but don’t, yet remain above the periphery, suggest that the rigid demarcation Dependency Theory makes is too absolute and too inflexible. This is a criticism Immanuel Wallerstein (1979) takes on with World Systems Theory. Another key criticism is that the Marxists clearly miss is the importance of values to the debate about Modernisation Theory. Talcott Parsons, Alex Inkeles, Daniel Lerner, etc, see the importance of values – even if they dismiss the values of traditional societies as primitive and backward – yet the Marxists largely ignore them. While the Marxists tend to see the intent of economic servitude in the application of Modernisation Theory, from a sociopsychological perspective it appears as much the case of blind ignorance and a complete lack of understanding of how human motivational systems develop – both individually and culturally. Much of the Third World – particularly in Black Africa, is trapped in the PURPLE and RED zones culturally. Deep tribal divisions and insecurities – as in Rwanda – created originally by the cross-tribal boundaries the European colonists imposed have been exacerbated by the pressures to modernise and compete in a globalised world. On top of which Western myopic blunders have facilitated a seemingly endless run of tyrannical despots pursuing their own whims and filling their own pockets. No wonder one country or other in Black Africa seems always to be caught up in civil war. No wonder the awful spectre of genocide seems always ready to strike when PURPLE, the cognitive base of the Spiral, has been so completely trashed. The Marxists recognise all too clearly the negative impact of Western policies on the Third World and attribute that to a deliberate intention of economic enslavement of the periphery to the core. However, what their superficial, ideology-driven analysis misses is that, in many cases it is the mismatch of values – to use 4Q/8L – of Pre-Modern PURPLE and RED in the culture of the Lower Left to the Modern BLUE and ORANGE in the Lower Right – which undermines Modernisation Theory as much as any subversive intention. Arguably the key contribution Dependency Theory has made is to move debate beyond the Modernisation Theory approach that lack of development was due solely to the internal culture of developing nations. Instead Frank focused on the role Western nations played in creating the conditions in which ex-colonies often found themselves after independence. However, the fundamental weakness of Dependency Theory is that if offers no realistic solutions to global poverty while Capitalism has brought tangible benefits to the world – even if very unequally. The collapse of Communism in Europe in the early 1990s and the apparent conversion of China to a form of entrepreneurial Capitalism in the late 1990s has further undermined the credibility of Dependency Theory.